Would you like to know the quickest way to get attention from the world? It’s pretty simple: disappear from the online world for a while, make everyone partially aware of a drastic infamous change in your life and then suddenly post these four words on your Facebook wall “i want to die”. Just like that, plain and simple with no punctuation marks and capitalisations. Remember to post it in the wee hours of the morning for full effect. And most importantly, mean it. I’ll be honest, the result is not fun at all but I guarantee it will do the job if you’re after attention. Unfortunately for me, I haven’t done it to catch attention or gain sympathy from others. I just went so freaking crazy that when I grabbed my phone and the Facebook status bar asked me what’s on my mind that night I foolishly took it quite literally and typed the words. My heart felt so heavy causing my soul so much pain it had to give birth to those words. Right under my nose, I watched them roll out into the world like little monsters that will haunt the introverted side of my ambivert self forever. And it’s so damn scary. Seriously, I think the government and the private sector should consider this idea: every employee should have the freedom to choose where to report for work. I think most extroverts and those who are single would still choose the typical office set-up. Nothing’s wrong with that. I think however, that this set-up which was made the standard of the corporate or professional world is only for some type of people but not all. I honestly think it was a big mistake to let it apply to all. Just like in everything, there is no such thing as one size fits all. Introverts are but a victim of the society designed by extroverts. Perhaps due to lack of other options to meet people during the dawn of civilisation but to meet at a certain designated place face to face, we have the traditional set-up that we have now. Times have changed, we now have options. Working from home and telecommuting should be made an option for real and as a permanent set-up with those employees who opt for it. We always envision how the future would be–where people can work from anywhere they wish to and meet only virtually with their holograms. I think we fantasize way too much about the future that’s near that we forget to see it’s actually here. I’ve been interviewed lately through video conference with the person interviewing me being eight hours away by flight with a three-hour time difference and it went so smoothly and efficiently. How much more possible would it be to meet and do day-to-day work with colleagues who probably live in the same area and city? I see that steps getting to this are being taken using work-from-home options but the culture and mindset of people in organizations especially of people in higher office make it impossible to feel natural about it. I mean, let’s be honest, it doesn’t feel as accepted as the HR department would wish to portray when they are advertising to hire. Everyone feels guilty somehow for working from home when everybody is in the office. And there’s the notion that those who work from home aren’t really working. To meet the need to have face-to-face discussions and effective catch-up meetings, there should be a regular everyone-goes-to-office day. Depending on the organisation, it can be once a week or fortnightly or even monthly. The point is, everybody will look forward to this day because it doesn’t happen everyday–much like a Christmas party. People will dress up and be early for this go-to-office day instead of the current reality we have where everyone goes to the office daily at least five times a week at a fixed time, most of them dragging their feet to work and some just counting the hours till it’s time to leave. This culture is counterproductive. I’d say, let those who want to go, go to the office and those who want to work from home do so. Why do I think this will work? Because I believe that all people yearn to work. Otherwise, they won’t apply for a job. They would look for a sense of accomplishment and this revolutionary change which gives them choice would free their minds of societal constructs and limitations. So even if they are not in the office, they would finish their work and finish them well. Most HR organizations understand that not all people have the same personality and that workers from Generation Y easily get bored and have a very different style of working from their more experienced colleagues. Yet they stop at these findings. They put a lot of effort investing at building fun rooms and team buildings, out-of-towns and parties, or half-baked flexible options to work from home once a week IF and ONLY IF you reach a specific tenure working for the company–those just won’t work. If they really want to win the hearts of and retain GenY-ers, they should embrace the idea of choosing the set-up that works best for a person. Is he an out-of-office employee or an in-office buddy? Let loose, give them the freedom to work in a set-up that fits their personality and trust that they will deliver. How do I propose to implement this? During recruitment, once a candidate has been chosen to be fit for the job, ask the person to take a personality test–depending on how much the company is willing to invest, this can be as advanced as the personality identification test used in the movies “Divergent” or “The Giver”. The test will help identify if the person will be most effective working with people around him or he can be more creative and efficient alone, in the comfort of his own home or wherever he wishes to. So then when the employee chooses, the employer will have an idea if he’s choosing something aligned with his personality type or if he’s just being lazy (which is the fear of most old school bosses). The important thing to note is that, the company must give that high degree of trust. The fact that the candidate was chosen should be assurance enough that he is a matured person–enough to be able to handle the role; make calls, arrange meetings, go to the office to meet another employee who prefers to meet in the office, go after colleagues’ outputs and coordinate for deadlines; regardless whether he chooses to be a home-based or an office-based employee. Accountability and monitoring of output and performance must be the control points of the organization to ensure discipline and performance tracking is still in place and working effectively. Not all of us enjoy waking up early to make it to 8:30 or to satisfy the 9-5 daily grind. This is the reason most people feel like they are in the rat race. Our minds are bugged down long before we set foot into the office. We fight it deep inside but can’t do anything about it because it’s mandatory. Like prisoners, we struggle to save up enough for our own businesses or to retire young and bail ourselves out of our cages. This is why we feel like corporate slaves. We are forced to follow someone else’s mould, which are not ours. Some people would reach their optimum with this current set-up. Sure, it has its advantages. But most of us just flourish in our own environment, something which we define ourselves. This is why people who work for jobs that require the right side of the brain to work most often suddenly drop everything and start from scratch in the field of arts or in building a business that is so far from what they were trained to do. For all I know, they have always loved what they do. It wasn’t the work that they hated, it’s the set-up that was forced into them when it’s not fit for their personality that actually burned them out. For example, not all finance people wants to go to the office and sit there in front of a monitor 8 hours a day every day! I believe most people who are really good with numbers and enjoy analysing quit finance because they thought it’s not for them. The truth is, they only wanted to be able to work freely. It’s sad, but most of the real organizational talents would be lost from the corporate world by this modern day cry about following one’s passion in the arts and going freelance. Who knows whether they have always been already working on what has always been their passion (otherwise, why did they take those courses in college)? I don’t see anything wrong about encouraging a finance person to work from home–start when he wakes up maybe at 10am, drink his coffee which he had time to make for himself, work from bed or the comfort of his own balcony, beside his wife who drafts the sales contract for her next customer. If the books get closed and accounts balance by period-end, the employer and employee would find themselves in a win-win situation. What should be the problem? If this is the set-up, I don’t see a reason why the employee would leave. The truth is, if employees only manage their own businesses, they would most likely be working like this–from home, beside the people they want to be with, asking them questions like what they think of his or her next idea randomly while working on his laptop. This is where great ideas start and are fuelled–where we are most comfortable, with people we trust and whose opinions we value. And when these employees are only working for their own personal, non-work-related projects, that set-up always proves to work. Companies should not fail to see this and harness the potential innovation and creativity this would bring. The thing is, they all claim they are pro-change, they embrace the modern way of thinking and the technology and information age. They say they are revolutionary and love new ideas but they keep doing the same things. They haven’t changed the way they do things. At most, companies spend on seminars and workshops to understand employees but they won’t go as far. I’d tell them to just take the risk, trust the people and embrace this new era. Know the new generation and harness their uniqueness, fluid personalities and creative spirits for their businesses to succeed. Just please, especially in this kind of weather…let us work from home. It was a Sunday night, 5 days before my 11th birthday, when we received the tragic call; my daddy was dead. The day before my birthday I sat nervously locked away in a back corner, hiding from his corpse displayed for the viewing pleasure of all those that had loved him as much as I did, “He died doing what made him happy,” everyone kept saying over and over and over again as they passed me. Looking back at my life, I can tell that statement became a subconscious mantra. My grandfather was founder of a bank in Houston and as I hit teenage years I would spend my summers working there. At dinner time my grandparents would build me up, “You will be a banker, there is no more accommodating field for a woman to climb to the top.” They would groom me for a position they had in mind for me at my grandfather’s bank. Each day as I sat behind my desk my soul would fade, I would find myself venturing onto Livejournal to just write, my heart was not in my work, and I was miserable. Once at the university, I finally began taking only what made me happy. Although by my later teenage years my responsibilities for my brothers had faded, it was a difficult state of mind to shake. It was difficult to just let go and be a child, but in the dorm, for the first time I experienced a euphoria of freedom. I began to really laugh. I began to take whatever classes sounded like they would make me happy, and bring great interest to me. If a friend said a prof they had in astronomy was amazing I signed up for it, if I read that a women’s writers teacher was the bees knees on a school review I would apply. I took whatever sounded fun at the time with no real direction. Finally in my Junior year, I was called into an advisors office who said I had to declare some sort of major, we looked at my plan and with my credits English junior high education was my calling. I married a man at 21 that made me laugh, I was only a sophomore in college at this point. We bought a house, and though his salary paid for our home he wanted my equal contribution and requested I get a job. I applied at my favorite store in the mall, the one I visited every Tuesday night for inspiration and story ideas, and within weeks was their new lowly sales associate. The man who hired me was the most jovial man I had ever met, he had that distantly familiar genuine twinkle of happy in his eyes. He let me know that my job was to make my customers’ day. I was inspired, my job was to bring joy to customers! I was encouraged to dance, I was encouraged to laugh, I was encouraged to reach out to each and every individual and bring a smile to their faces. I was given the opportunity to listen and to care. I was able to take the sad and mistreated and inspire or reignite a light within. I felt my mantra come to life. With great consideration and pain I left my retail career (now an assistant manger) after a year to student teach where I was told not to allow laughter in my classroom. I was told to teach the children how to answer questions on a test, not to teach them the correct answers. I was told I could not encourage their own laughter and clowning. The principle would walk in if she heard laughter and tell me she could not concentrate, that we had to work silently in my classroom. This was the career path I had chosen, this is what I had studied for. But one night I sat and thought of my last conversation with my father. I remember there was no time that I saw him with more confidence and excitement then when he was describing to me his successes as a traveling sales man. We lived in the desert, and he sold scuba equipment which ripped him from our home for weeks at a time. He showed me all the sales he had made, how suddenly we were going to be able pay off debt, and how someday soon we would own a red suburban (his dream car). He had such a passion and talent for sales, and so had I. For his final breath he was standing in the pacific ocean with his best friend, just off the shore of California, putting on his flipper to begin another dive. I didn’t want to die doing what I felt I had to do. I was going to spread smiles and laughter, I was going to return to sales. Posted on March 31, 2015 March 31, 2015 Author shopgirlanonymousCategories CareerTags blog, Career, grief, happiness, life, loss, retail3 Comments on My Quest for “Career Bliss”–Yes, it Exists! There is something particularly special about the fact that wherever we go, regardless of the nationality of people we see around us, we always kind of know who to trust in an instant–by looking at their faces, the way they act, what they hold, what they do, even if we don’t hear them speak. Perhaps, I’m referring to what we usually call instinct. When travelling alone waiting for the boarding gates to open in an airport for instance, we scan the waiting area before settling in a vacant seat. Apart from being vacant, we also look for the area where we find people we feel we can trust most. Without talking to them, we kind of already know we’re relatively safer sitting closer to them than others. The whole time inside my head, I was just telling myself “Do not speak to strangers. Do not speak to strangers.” And I didn’t look back, I hurried to the gates where I was caught up in the queue when I heard two old ladies talking from behind me, they were asking each other if they were supposed to queue or wait since they’ll be seated on the sixth row. I said, “They said rows 30 up should fall in line first but I think you should be fine. They’d probably let you in anyway.” We started chatting then and up till we boarded the plane. I even nicely said goodbye when they took their front row seats. While I was walking to my seat towards the back of the plane, I realised they asked me some more personal questions than the tall guy actually did but I comfortably answered all of them. They also shared some information about themselves and I learned that they are US citizens who travelled to Sydney and now off to Manila for vacation with two other friends who were in wheelchairs and therefore, will have to board last. I wasn’t the only one too trusting, they also were, considering the vulnerability of their pack. They were really lovely, reminded me of my late grandmother who raised me up from childhood. I don’t think what they were wearing were fancier clothes than the tall guy. They probably even hold the same type of passport and came from the same country. In the 21st century for a woman my age, who would turn away from a rich-rapper-looking guy to talk to some old grannies? But our instincts just know who to trust. Is that being bad, perhaps judgmental? If one is travelling alone, is being selective with who you talk to considered bad? Is being rude justified? How do we know when to be friendly and when to be on our guards? I could probably do some analysing here— think of all possible factors affecting our instantaneous level of trust, draft a model and then run the regression after collecting data from a good number of sample. It would be an interesting economic research paper. And then we’ll see which factor has the strongest correlation to our trust level of a stranger. But I can only do this with some data—a survey; questionnaires, interviews of some random people of different backgrounds who have travelled alone. More interestingly, I could explore deeper and try to find out which instinctive judgments made have been strongly, directly proportional to the actual personality of the strangers judged—this one would require more than a survey but a full experiment. Unfortunately, I do not have the time to do either of these. So I’ll just resort to trusting my instinct and common sense being particularly careful in situations like this. In any case, my guess is that the results of such study will show that a person’s instinctive judgment would prove to increase reliability in direct proportion with age. I’m saying the younger we are, the more likely we are to misjudge people. There may be outliers of course, the influencing factor being experiences with people and how much one’s seen the world in general. That being said, I could probably conclude my research saying a person’s level of maturity, shaped by his/her experiences in life would show the strongest correlation value between his/her instinctive judgment of and the actual facts about a stranger. This would incidentally explain how unwise our relationship choices were when we were younger and how many wrong choices we’ve taken when it comes to love. But then again, once the right level of maturity is reached, our instinctive judgment of a person improves. By this time, we may have already trained our instincts well and have increased the precision of its judgments and their correlation value with the truth. We probably would look less on the person’s physical appearance and begin to see right through him/her at the first word he/she utters. A lot of us, young people rely on what we’ve heard somewhere that once you see the person who’s the one for you, it would only take a moment. You’ll just know he or she is the one the first time you meet him/her. That probably may be overly romanticising it. I think it’s true for some but more rationally put, they get caught up in that one right moment the first time they meet the other person because they talked and they found out that they just click and they end up being actually right for each other. These are the ones who have probably met when they’re level of maturity and instinct’s training were ripe and ready. So when their subconscious told their conscious mind “Yes, this person seems to be perfect for me and I can entrust him/her with my vulnerable side,” this instinctive judgment was as close to reality as possible that the risk of being wrong is negligible. They would then interpret this as falling in-love. The subconscious and its instinctive judgment, we then refer to as “our hearts”. Thus, we say the heart knows when it’s found its home. Although, thinking about it—the subconscious gets inputs uploaded to the brain by the conscious, so the two are still connected. So it’s actually our mind through this process, not our hearts, that “fall in-love”. Yet for some people, love-at-first-sight is not the case. They are those who have long known each other for a long time but never quite realised any sooner that they were a good match and that they can live and make each other happy for a lifetime. These people would seem matured from the outside but remains unaware that their instincts’ training have not been enough. So they have often misjudged the one that is actually perfect for them as being just one of the other strangers—just like everybody else. It would take some time; and for others, some heartbreaks; before their instincts come to full maturity enough to see that the once-friend-zoned is actually the ONE. And then there are those who grow old in age, face too many heartbreaks, make the same instinctive misjudgments again and again and still keep their instincts immature—keep spitting out the same kind of misjudgments leading them in cycles. I would like to believe that there is nothing in their conscious mind that wills this, everybody wants his/her own piece of happiness. I think there are just too many factors messing up with the subconscious that the natural process of maturity of the instinct and growth of that subconscious superpower to see through people is halted and this disorder goes on for an uncertain length of time. Sadly, some grow old and die never fixing such disorder, living with a malfunctioning instinctive judgment all their lives. But then there are a few lucky ones of this type who find someone with matured instincts, who can tell that the person are their match even as they can see exactly how messed up he/she is. These people get the chance not all people can experience in their lifetimes—to sort out another person who has a malfunctioning subconscious and a persistent inability to mature and see beyond strangers and people. We all have the ability to help repair another person with such disorder, but not everyone gets to try his/her hand on it. These cases usually make for the most unique and dramatic love stories. Of course, these are all just theories inside my head with no way of me proving them at the moment. I’m just sorting out my judgments of people inside my head, wondering whether I am writing this with a matured instinct or not. You of course, dear reader, are free to hold on to the most famous theory of falling in-love, finding the one and experiencing magic in moments. It’s not of much use to ponder on this for now. In the meantime, I’m sleeping in the plane just about now and will publish this as the first WordPress post I’ll ever do from my hometown in a few more hours. Here in Australia, we always say (at the risk of sounding cliché) that we are indeed a blessed country. I am certainly no expert, but I personally find Australian cuisine really quite difficult to define because it’s such an intricate fusion of all the cultures that have called this wonderful country home since day dot. These days, we have the opportunity to take our pick from an endless array of cuisines when dining out, or looking for something different to whip up at home for dinner. For me personally, the ultimate Australian food experience is enjoying a really delicious meal that is made from locally-sourced produce that comes with a stunning view of the local countryside. 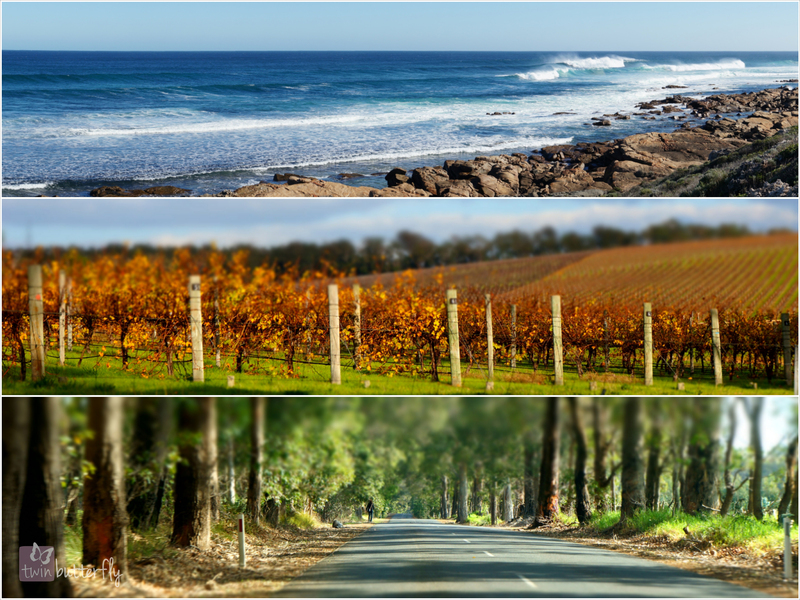 One of my favourite places in the world is right here in the south west corner of WA – Margaret River. Boasting of a stunning location nestled between jarrah and karri forests and a beautiful coastline, it’s one of Australia’s premium wine producing regions. And where there’s good wine, there is bound to be good food! This option is a blessing for an indecisive Gemini like me, who often finds it very hard to choose just one dish when there are an abundance of tempting items on the menu. When done correctly, tasting plates are also an ideal way to sample the best of the region’s seasonal harvest and locally-crafted products: from olive oil, cheese, fruit and veg to meat and seafood. Beer drinkers can even opt for a tasting paddle at the local craft and micro-breweries! I have enjoyed many fabulous tasting plates in Margs – in my opinion, the best ones are shared with a friend or loved one (to avoid any possible food envy), and served with a glass (or two) of local wine. About five or so years ago for a ‘significant’ birthday gift, a group of friends pitched in to buy me a voucher for a private chauffeur-driven wine tour in Margaret River (they know me SO well). 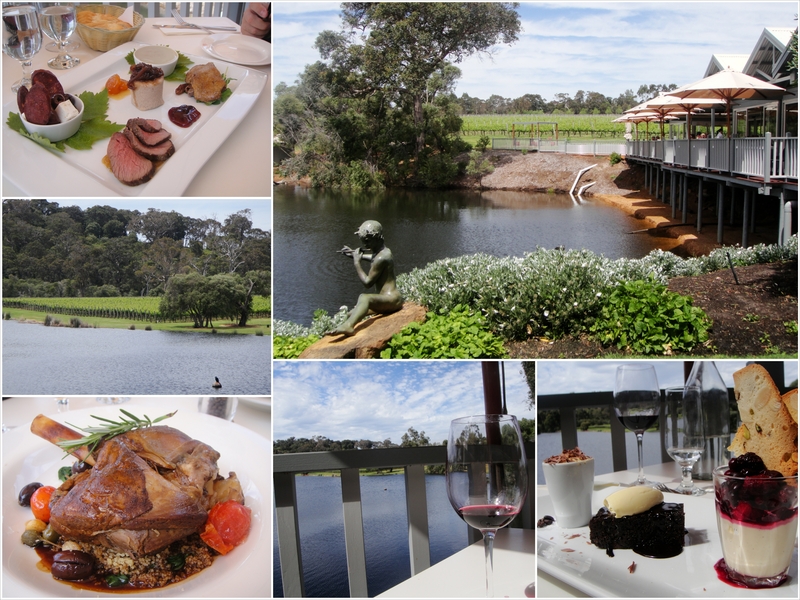 While being chauffeured to several good winery cellar doors for tastings (and a “bit” of purchasing), the tour included lunch at Flutes Restaurant at the Brookland Valley winery estate. I wasn’t sure what I should be expecting. A tasting plate with a glass of wine perhaps? That of course would have been perfectly acceptable, but what transpired was actually more breathtaking. The setting was simply spectacular. We were on an open deck overlooking a large lake surrounded by vineyards in one direction, and forest in the other. Being a weekday, the restaurant wasn’t particularly busy (either that or I was so involved in what was going on at our table to notice we may have been the only ones there), so all you could hear were birds singing, and the occasional quack from the ducks swimming on the lake. Yes, we had a tasting plate – but this was just the entrée: a charcuterie platter of delicious morsels such as pork rillettes, chorizo, duck and pâté. Up next was the main course – a tender lamb shank served on a bed of couscous infused with exotic spices, capers, olives and tomatoes. One look at the sheer size of the dish made my stomach shrink in fear; however, my tastebuds managed to convince it to take on the hefty task of devouring the lamb (the velvety Cabernet Merlot helped as well). I’ll admit, I couldn’t finish it, but I gave it a good ol’ Aussie go! Before you could say “I couldn’t possibly eat another crumb”, it was time for dessert – a trio of petite sweet treats. This time it wasn’t a shared platter (although that would have been the safest/most logical option) – we were given one each. The groans of borderline discomfort quickly turned to sighs of pleasure when we battled all resistance and bravely picked up our spoons to try the tiramisu, vanilla bean panna cotta with berries, and a chocolaty slab of chocolaty chocolate mud cake drizzled with chocolaty chocolate syrup and double cream. Did I mention the chocolate? All that was left to do was be practically carried back to our hotel (through one more winery just because we could), lie back and digest what had just happened (physically and metaphorically). The great thing about a place like Margaret River is the sheer variety of accommodation choices – you can choose to stay in a hotel right in the centre of town, or venture further out to anything from a quaint Bed & Breakfast or farm-stay, to an all-inclusive luxury resort. Alternatively, you can select from an endless array of self-contained apartments and cabins either close to town, by the beach, or nestled within a forest setting. Anything goes. 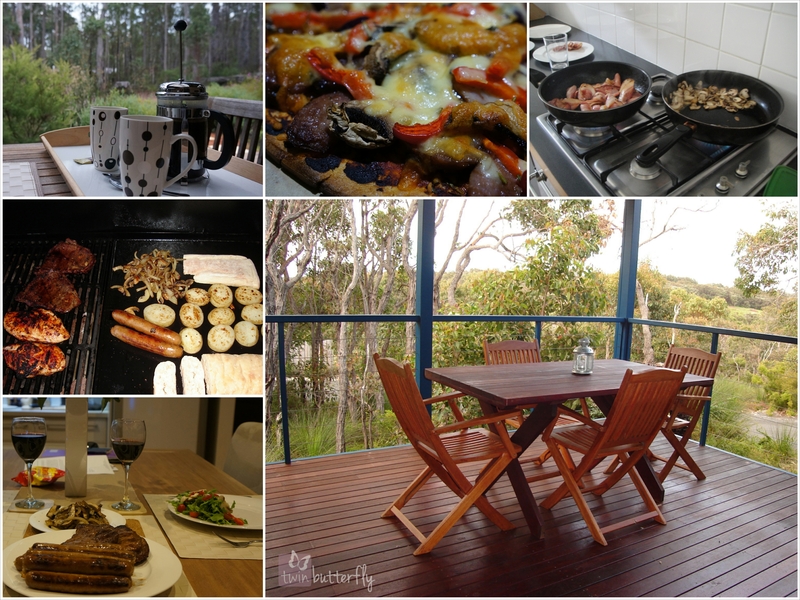 There is something so much more pleasurable about cooking while you’re on holidays than doing so at home, although my Other Half and I tend to stick to the same basic formula on a short break – barbeque one night, and if there happens to be any leftovers, use them as topping for a home-made pizza another night. As an added bonus, a lot of self-contained accommodation in Margaret River makes the most of either one of its settings: its idyllic forest, vineyard, gently sloping countryside or the beach. Some of my favourite moments in life have been relaxing on a deck with my morning coffee enjoying the tranquillity of the natural habitat with nothing but the sound of birdsong and a gentle breeze to keep me company. The super lucky ones may even spot a kangaroo (or two)! The best part about staying in a memorable place is having the opportunity to take a small piece of it home with you so you can continue to enjoy it long after the journey itself has ended. A cellar door offers much more than just the opportunity to sample a few wines – they add to the overall experience. Many wineries have a country-style charm about them, or are simply jaw-droppingly beautiful, begging to be explored. And in most cases, there’ll be an infinitely interesting history behind them. I’m by no means a connoisseur of wine (in fact, very far from it), but I do enjoy the explanations and recommendations provided by the cellar door staff as you boldly make your way from sparkling through white and rose to red, and – if you dare – heady fortified wines (I’m one of the fortunate ones who aren’t particularly fussy when it comes to wine – possibly my trade-off for not being able to drink beer, if only by choice). The secret is to take your time and enjoy the moment. And if the obnoxious wine tour groups sharing the space start getting a little too demanding and raucous, step back and browse through the assortment of wine accessories, books and giftware on offer; or explore the picturesque grounds until it’s time for them to depart for their next stop (all the while secretly hoping it isn’t where you were planning on visiting afterwards). 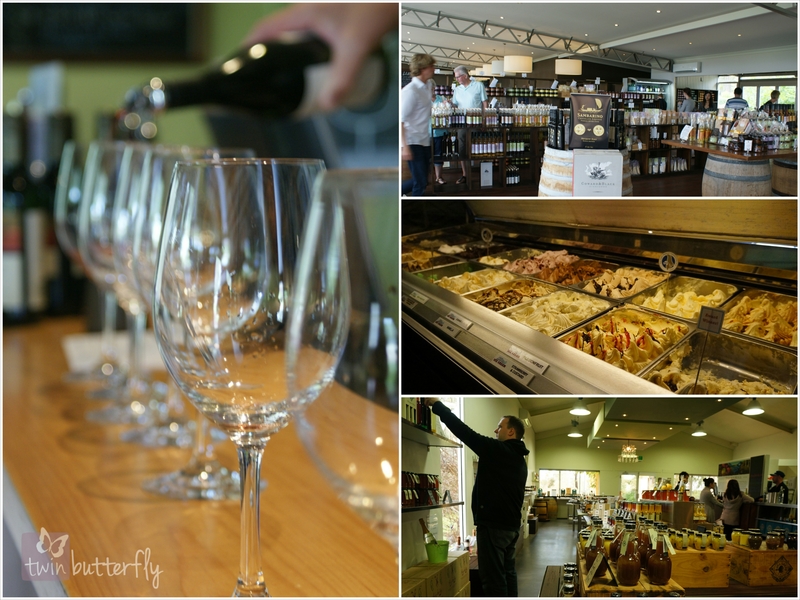 If the winery has a café…bonus! 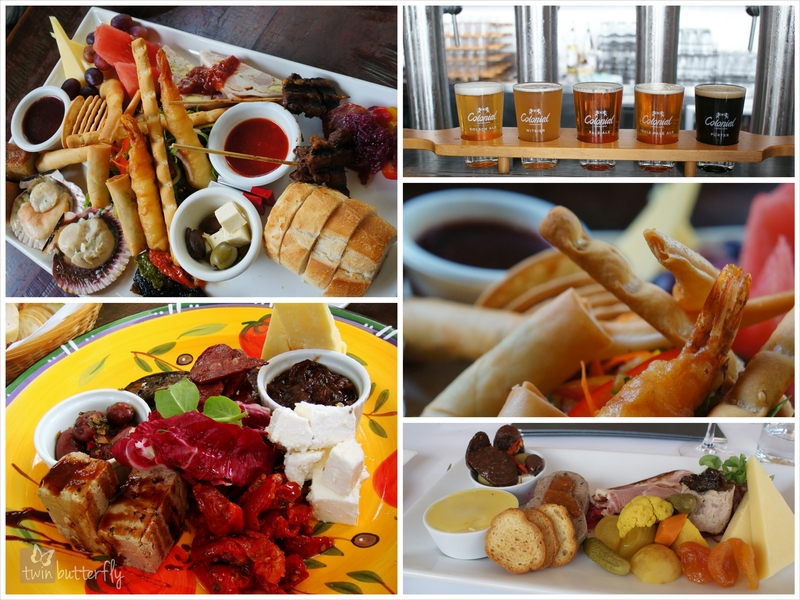 Cellar doors are not just restricted to wines – in Margaret River there are all kinds of options for exploring tastes of the region: beer, cheese and yoghurt, chocolate, coffee, fudge, olive oil, venison, nougat, fruit, jams and preserves, cider, lollies/candies, and ice cream just to name a few! What a treat it is to take a little piece of Margs heaven back home – each time you fill a glass, break off a piece, or top a cracker or piece of bread, you’re instantly transported back (if only for a moment), allowing you to enjoy “the trip that was” just a little bit longer. It’s a bittersweet day in my house though, when we get to the end of our bounty (‘cellaring’ is not something we do very well). It’s almost as if we’re bidding our blissful break farewell all over again. On the other hand, it can only mean it’s time to start planning the next trip! Located about fifteen minutes’ drive from the town centre, The Berry Farm is the one place I never fail to revisit every time I stay in Margaret River. 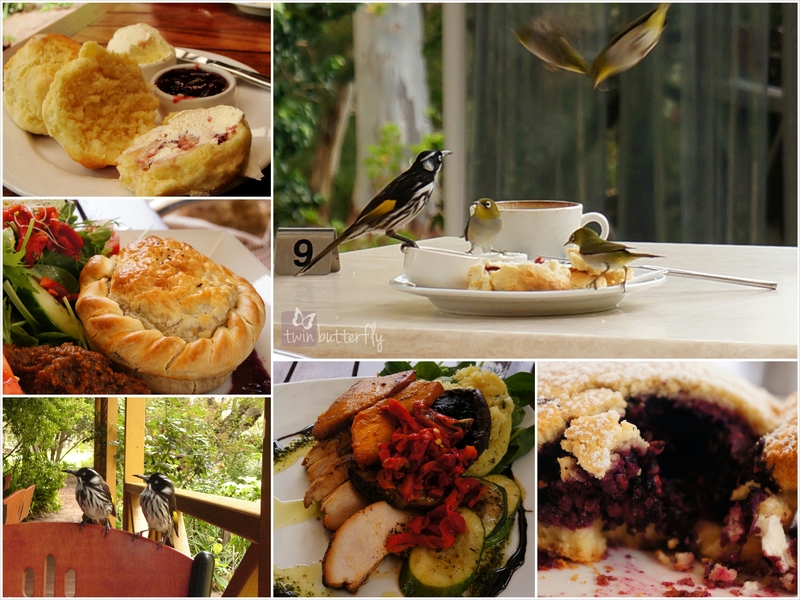 After a pleasant drive winding through tree-lined roads, vineyards and lush green pastures, the first stop must be the Cottage Café and Gardens. Whether it’s for a quick cuppa to start the day, something sweet for morning tea (they are particularly renowned for their Boysenberry Pie and Scones with jam and cream), or perhaps a more substantial meal for lunch, you are in for an absolute treat! Not only is everything on their seasonal menu fresh and delicious, the historic building with its jarrah interior and wide patio oozes comfort and country hospitality. 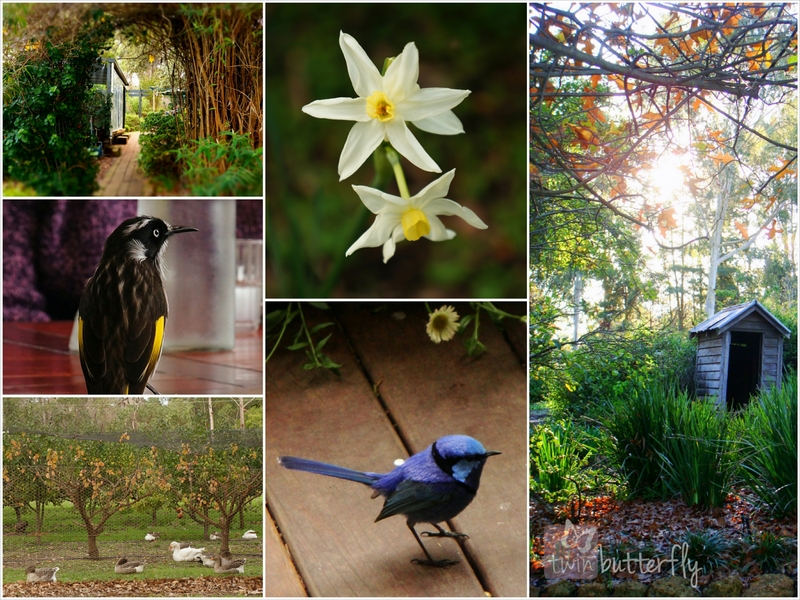 The surrounding picturesque cottage gardens teeming with local birdlife add a magical touch no matter what time of year you choose to visit. Don’t be surprised if you find yourself sharing your pots of jam and cream with New Holland honeyeaters and silvereyes. The next step is to take a stroll through the lovely cottage gardens that surround the café – there is always something pretty in bloom, regardless of the season. If you’re lucky, you may even spot a Splendid Fairy-wren (the name says it all)! On the way in (or out), you may notice the interesting array of ‘lawnmowers’ that graze below the vines and fruit bushes near the property’s entrance – geese, chickens, emus, I’ve even spotted a peacock! Of course, no visit to the Berry Farm is complete without checking out their amazing Cellar Door to sample (and purchase) from their extensive range of gourmet products including homemade jams, preserves, pickles, sauces, fruit wines, liqueurs, and – my personal favourite – their Club House Series of fortified wines. I never leave without at least two bottles of Boysenberry Port (No. 3) to take home and enjoy as a perfect nightcap with a square or two of dark chocolate…or warm brownies. I’ve been fortunate to visit the Berry Farm at different times of year. While the menu and gardens change with the seasons, the eternal charm, beauty and indulgent treats on offer ensure I always leave with a big smile and happy tummy. And that goes for all of Margaret River as well! I must extend my sincere gratitude to the lovely Care for this exciting opportunity to be a guest ‘juicer’ on her beautiful blog. I’ve been a big fan of Flavored Lemons since we ‘met’ at the beginning of the year via a Blogging101 course, and I have to admit I’m a bit nervous that my rather bombastic, impulsive style of writing may seem a little out of place here. In any case, this really was a fun, challenging experience. Thank you, Care! I had the perfect excuse to work from home today. The property manager conducted the very first inspection of the unit we are renting. I did actually work but I also realised, now more than ever, that my ideal life is waking up to a day like this. Working in my sleeping clothes; having breakfast, lunch and snacks without the time constraints; freely surfing the net about an idea that suddenly pops into my mind without worrying if my boss or an officemate is looking over my shoulder to see what’s on my screen–all this is just perfect. I definitely want to work. I’m not actually sure if I can last a day without getting in front of my computer to make myself busy with something worthwhile. But I guess after some time, people eventually tire of the normal 9 to 5 routine and the ordeal of waking up in the morning to go to the office, waiting for the clock to strike closing time. Specifically for me, who’s an introvert (lately, I’ve been receiving feedback and psych test results saying I’m an ambivert or an outgoing introvert), I love working on my own. I don’t have issues dealing with people and working in teams, only saying as a matter of preference, I’ve always loved being in control of a specific work from its beginning through to the end and having the fulfilment to call it your own. This may sound vain but I enjoy working with myself, participating in those productive discussions happening inside my head. This is why I always believed I’m an artist and I was aways meant to be one. Unfortunately for me, I was born and educated in a third-world country where that career path is a luxury and only those born to rich families who would almost always have the right connections can realistically assume they’ll make it big. Talent is definitely not all you need in the third-world. So I worked my way up through a more profitable, practical and safe profession. It enabled me to save and get most of what I basically need. Most times, it afforded me with more than what I need. These types of job can bring you to places, countries you can only dream about if you’re a struggling artist (especially writer) in some far-east country whose foreign exchange currency rate doesn’t even appear in the banks’ boards. Ultimately, this type of job gave my husband and I (both working in the same field) the privilege to live in a first-world country while we are still young. For that, I will always be thankful. Not out of sheer gratefulness though, I’m still doing the same thing I used to do since I got out of the university to fend for myself. Today, I got two emails about job opportunities (in the same line of work, of course). I have not replied to either of them. I wished to move to a new job because my current one doesn’t really pay much (not complaining here, I’m just fully aware how much more on the average similar positions pay), but deep down I secretly wish there was another option for me. I was hoping to get a job that will allow me to do something I really love doing. So I went looking for opportunities for writers. Most of them either require experience (which I don’t have because I spent all my professional life becoming an expert of something else) or involve writing for companies–asks you to promote brands, products, company websites, etc. The latter is not a far cry, in essence, from what I currently do with so much less money. There are opportunities for writers with no experience which, I can tell upfront requires tons of work but pays as little as $1 per page. On the average they would expect 10 articles a week. If I’ll do that full-time, I could possibly achieve their targets (and mind you, the topics are not the least bit exciting as you might have imagined). But doing it full-time means I have to give up the salary I currently get for a maximum of $30 per week, assuming I write 3 pages per article and turn in 10 of them per week. Wow, I definitely can’t live on that. I don’t know how full-ime writers could have survived their days when they were all still starting out. I read some articles written by full-time writers honest enough to admit that they were able to pull it off only because they are lucky to have advantages that didn’t need to be part of their hard work–either with their parents or spouses who may have financed them before they made it big or at the least provided them with all the connections or head-start they needed. Realistically speaking, success in this highly competitive, low-paying field with a highly saturated market demand may be just a chasing after the wind. Maybe for most, writing (or whatever their passion with some inclinations towards the arts is) were just only meant to be a hobby. This is not yet heaven yet, after all. I can say blame it on commercialisation, industrialisation and the market economy, And yes, I’ll say this as a well-informed, sufficiently-educated economics graduate. But today I prefer to be a realistic layperson, so I’m blaming my fundamental need to provide amply for myself and my family, and my fear of treading the unknown to start somewhere bottom-low, even lower than when I started out with where I am now. Oh yes, I’m just a coward. So I’m responding to those two head-hunters who sent me those emails about finance job opportunities and for the time being, forget about ever having the same work-from-home everyday lifestyle that I had a taste of just for today.